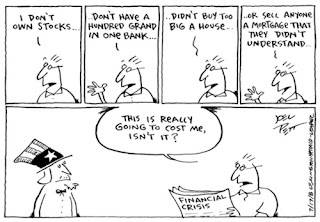 2008 CRISIS | The Asymmetry of "Moral Hazard"
"Moral Hazard" has been defined by the insurance industry as the situation that can be created by property and casualty insurance, namely that people pay less attention to reducing risk. The insurance industry deals with this problem by (1) creating a set of rules that require the insured to take normal precautions to prevent risk, such as keeping their roof shingles in good repair and using only qualified electricians and plumbers, and (2) disqualifying insureds from collecting when they have not taken normal precautions, for example when they set a fire to their own house in order to collect the insurance money. But there is another side to this, the business side. There are situations in which a business is the beneficiary of passing on risk, not the consumer. Business in this case takes advantage of the consumer. My mother used to go after church to a grocery store that would sell her large bags of rotten fruit at an inappropriately small discount, after the grocer made my mother feel sorry for him because he hadn't been selling the fruit fast enough. My mother may have been satisfied with the gratitude that the grocer provided along with the rotten fruit. Virtue may also be its own reward. But decades later I still remember the uncertainty I associated with the fruit my mother brought home, and still feel some resentment at the grocer targeting my mother because she was a good person. Meanwhile the financial industry is a perfect example of moral hazard on the part of business. Back in 1933, the banking industry got the deposit insurance that it desperately wanted after the bank panics that peaked in 1932 and early 1933. FDR and his Treasury Secretary, Will Woodin, in March 1933 first flooded the banks with liquidity so they could meet the demands of depositors. They also eliminated the bottleneck to creation of more liquidity - i.e., the supply of gold - by ending the convertibility of gold certificates or any greenbacks at all into gold, even prohibiting the private ownership of gold. They then work on a bill to create the Federal Deposit Insurance Corporation to guarantee all deposits up to a certain size. The deposit-insurance plan was introduced by Rep. Henry Steagall of Alabama. That created a moral hazard, as was fully known at the time. 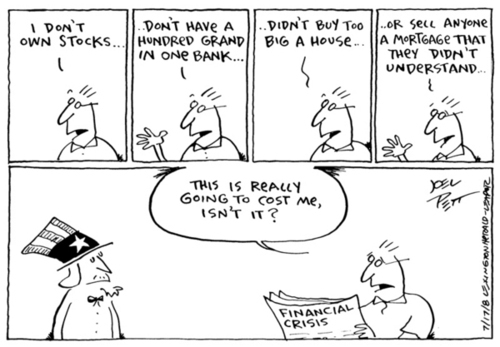 With deposits insured, bankers were free to take all the risks they wanted, knowing that the depositors wouldn't care. To prevent that, the Glass-Steagall Act of 1933 created a wall between the chicken coops of the commercial banks and the foxes of the investment banks. The investment banks were eager to use the commercial banks as a source of cheap funds for their high-risk investment activities. Virginia Senator Carter Glass was determined to prevent this from happening and he generated a series of safeguards that lasted for 70 years after the Act. The investment banks, being foxy, spent the next 70 years breaking the Glass safeguards piece by piece, while leaving fully intact and even improving the terms of the Steagall-generated deposit insurance. Get back to a set of rules like Glass-Steagall that limit taxpayer risk relative to bank deposit insurance. Enforce the rules and significantly penalize the financial risk-takers who initiate or permit use of insured commercial-bank deposits to fund speculative activities. This post has been moved to a private blog. To gain access, contact jtmarlin@post.harvard.edu.